Going back to work, especially on a Saturday, following a few days off can be less than appealing. Somehow I was ready early today and it occurred to me that a stop in a beautiful place along the way might make the transition easier. Though I rarely visit there, David Fortier River Park in Olmsted Falls is one of my favorite places. 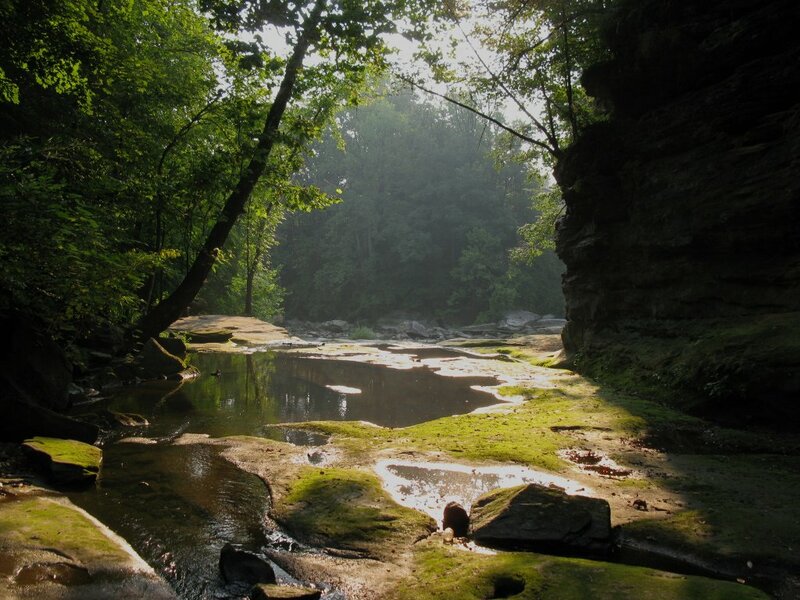 The Rocky River runs through a broad channel of rock in Olmsted Falls, smoothed by ages of flowing water. In the shadowed depths of the valley a secondary channel, much narrower, joins the river within the park. Trees and moss grow thick there and most of the time the waters run tame and quiet. To be surrounded by natural sculpture, soft light, beauty everywhere, well that's not a bad thing when you're on your way to work.